Still suffering from my cold/flu with congestion and the like making it hard to sleep. My solution, a Hot Toddy before going to bed. 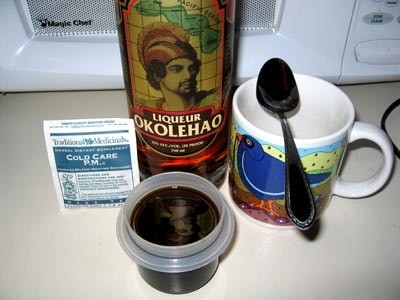 This Hawaiian style version has herbal tea, some honey for sweetener and a shot of Okolehao (70 proof). Much more tasty than NyQuil. It gets my recommendation if you can’t get to sleep. Did this last night and it worked like a charm. Which reminds me of the wicked chicken soup my mom used to make when we were really, really sick with the cold or flu. It was made with fresh chicken parts, usually cut-up leg and wing pieces and some celery I think it was a pretty clear soup, maybe some salt. Then she added a liberal amount of booze, Seagram’s VO or Wild Turkey or something similarly vile. Let me tell you, as a little kid drinking that thing it cleared you straight-up and made you possibly wish you were better and back to school. I guess it did work its magic though, industrial-strength chicken soup.